Pre-register for $20 or pay $25 at the door. Tasty tapas and a cash bar. Networking with your fellow professionals from Monmouth, Ocean, Middlesex, Somerset, Burlington, Mercer and Union counties. Put yourself in their Shoes for just a few minutes. Our mission is to educate our professionals on what one with dementia experiences so you can help better empathize and serve your patients, clients and residents. Learn the risks of hiring private aides and the risk for the aide themselves. The better we educate ourselves, the better we can educate our families and our staff. Your membership to CCNJ counts as a sponsorship because it makes it possible for us to do what we do. Memberships are $50 for the year. For a limited time only, sign up for a 2019 membership and get your ticket to the Bash on the Beach for half the price***!!! Sign up and pay for your CCNJ membership and we will send you a discount code for $10 off your ticket. ***Good for pre-registration only. You must be registered as a member by 4/2/2019. New sponsorships will be offered at a $200 discount off listed prices for the month of March and AT THE EVENT. After that, the "special" is over and prices that are listed on the website now will stand thereafter. Use the promo code [BoBSP0NS0R2019] to get $200 off your sponsorship! 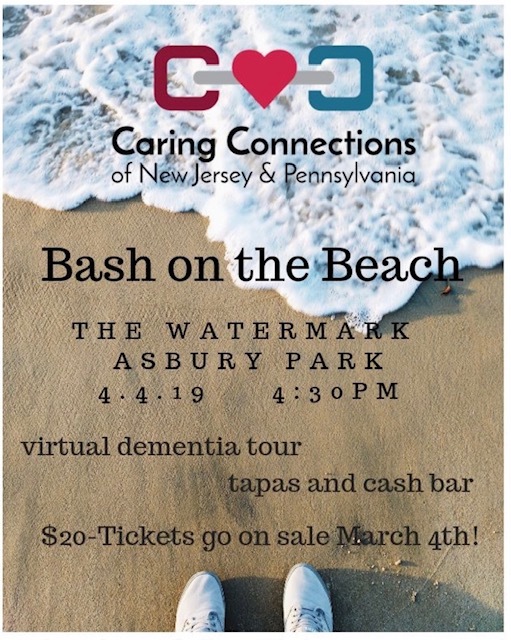 Sponsor the Bash on the Beach and demonstrate your commitment to seniors and their families in New Jersey and Pennsylvania!